A photograph of the "admit card" is being widely circulated on Twitter and Facebook. The admit card has the animal's photograph on it. Srinagar: Two years after a cow was issued an admit card to write an examination in Jammu and Kashmir, a hall ticket has apparently been issued to a donkey to appear for a recruitment test for naib tehsildars. 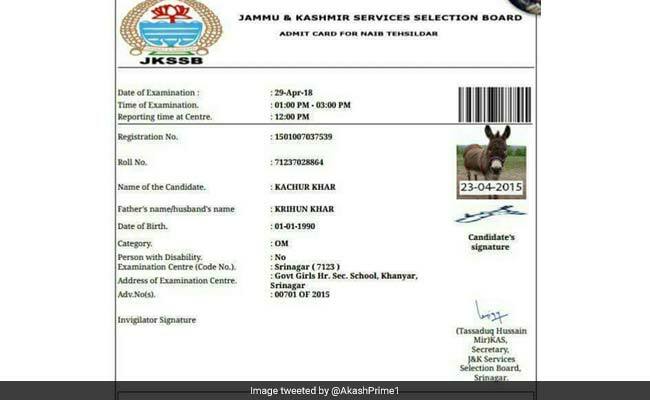 A prankster seems to have got an "admit card" issued by Jammu and Kashmir Services Selection Board in the name of 'Kachur Khar' (brown donkey) to write the paper scheduled for Sunday. A photograph of the "admit card" is being widely circulated on Twitter and Facebook. The admit card has the animal's photograph on it. Calls made to Board officials for comment on the lapse were not answered. Social media users were having a field day over the apparent lapse by the authorities. One Twitter user lamented the waste of resources the prankster had to indulge in to get the admit card. "It is ridiculous to get a system generated card in the name of donkey and then make it a news. It only shows how much extra time we have for wastage. Grow up," the user wrote. A Facebook user also lashed out at the Board. "This application form could have been deleted or cancelled easily by SSB officials from the system because the issue was already highlighted in 2015," the Facebook user wrote. In 2015, the Board of Professional Entrance Examinations had issued an admit card to a cow to write an examination.